Lake Champlain near Burlington during sunset. Lake Champlain (French: Lac Champlain) is a natural freshwater lake in North America, located mainly within the borders of the United States (states of Vermont and New York) but partially situated across the Canada-United States border in the Canadian province of Quebec. The New York portion of the Champlain Valley includes the eastern portions of Clinton County and Essex County. Most of this area is part of the Adirondack Park. There are recreational opportunities in the park and along the relatively undeveloped coastline of Lake Champlain. The cities of Plattsburgh, New York and Burlington, Vermont are to the north of the lake, and the village of Ticonderoga, New York is located in the southern part of the region. The Quebec portion is located in the regional county municipalities of Le Haut-Richelieu and Brome-Missisquoi. The Champlain Valley is the northernmost unit of a landform system known as the Great Appalachian Valley, which system stretches from Quebec to Alabama. The Champlain Valley is a physiographic section of the larger Saint Lawrence Valley, which in turn is part of the larger Appalachian physiographic division. It is one of numerous large lakes located in an arc from Labrador through the northern United States and into the Northwest Territories of Canada. Although it is smaller than each of the Great Lakes: Ontario, Erie, Huron, Superior, or Michigan, Lake Champlain is a large body of fresh water. Approximately 1,269 km2 (490 sq mi) in area, the lake is roughly 201 km (125 mi) long, and 23 km (14 mi) across at its widest point. The maximum depth is approximately . The lake varies seasonally from about 95 to 100 ft (29 to 30 m) above mean sea level. Map showing the Lake Champlain-River Richelieu watershed. Lake Champlain is situated in the Green Mountains of Vermont and the northernmost eastern peaks of the Adirondack Mountains of New York. The lake drains nearly half of Vermont. About 250,000 people get their drinking water from the lake. The lake is fed by Otter Creek, the Winooski, Poultney, Missisquoi, and Lamoille Rivers in Vermont, and the Ausable, Chazy, Boquet, Saranac and La Chute rivers in New York. Portions of the lake freeze each winter, and in some winters the entire lake surface freezes, referred to as "closing". The lake temperature reaches an average of 70 °F (21 °C) in July and August. The Chazy Reef is an extensive Ordovician carbonate rock formation which extends from Tennessee to Quebec and Newfoundland. It occurs in prominent outcropping at Goodsell Ridge, Isle La Motte, the northernmost island in Lake Champlain. The oldest reefs are around "The Head" of the south end of the island; slightly younger reefs are found at the Fisk Quarry; and the youngest (the famous coral reefs) are located in fields to the north. Together, these three sites provide a unique narrative of events which took place over 450 million years ago in the ocean in the Southern Hemisphere, long before the emergence of Lake Champlain 20 thousand years ago. The lake was named after the French explorer Samuel de Champlain, who encountered it in 1609. While the ports of Burlington, Vermont; Port Henry, New York; and Plattsburgh, New York today are primarily used by small craft, ferries and lake cruise ships, they were of substantial commercial and military importance in the 18th and 19th centuries. A variety of Native American names for the lake were recorded by historians. Many historical works give Caniaderi Guarunte as the Iroquois name for the lake (meaning: mouth or door of the country); the lake was an important northern gateway to their lands. A number of other sources give Petonbowk (meaning the lake in between) as the Abenaki name in their Algonquian language for the lake. The St. Francis/Sokoki Abenaki Band, who make their home along the Masipskiwibi River (in Missisquoi language, "Crooked River") in northwestern Vermont, call the lake Bitawbagok, which has the same meaning as Petonbowk. Some early 21st-century articles appeared during the Champlain Quadricentennial (2009) claiming Ondakina as the “local” native name for the lake, but none cites a verifiable source. 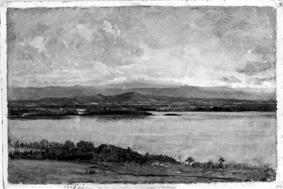 New France allocated concessions all along lake Champlain to French settlers, and built forts to defend the waterways. In colonial times, Lake Champlain was used as a water passage (or, in winter, ice) between the Saint Lawrence and the Hudson valleys. Travelers found it easier to journey by boats and sledges on the lake rather than to go overland on the unpaved and frequently mud-bound roads of the time. The northern tip of the lake at Saint-Jean-sur-Richelieu, Quebec (known as St. John in colonial times under British rule) is a short distance from Montreal. The southern tip at Whitehall (Skenesborough in revolutionary times) is a short distance from Saratoga, Glens Falls, and Albany, New York. 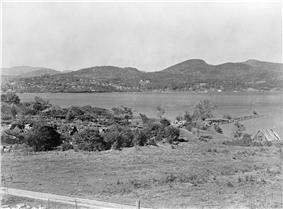 Forts were built at Ticonderoga and Crown Point (Fort St. Frederic) to control passage on the lake in colonial times. Important battles were fought at Ticonderoga in 1758 and 1775. During the Revolutionary War, the British and Americans conducted a frenetic shipbuilding race through the Spring and Summer of 1776 at opposite ends of the lake, fighting a significant naval engagement on October 11 at the Battle of Valcour Island. While it was a tactical defeat for the Americans and the small fleet led by Benedict Arnold was almost entirely destroyed, the Americans gained a strategic victory. The British invasion was delayed long enough so that the approach of winter prevented the fall of these forts until the following year. In this period, the Continental Army gained strength and was victorious at Saratoga. Three US Naval ships have been named after this battle, including the USS Lake Champlain (CV-39), the USS Lake Champlain (CG-57), and a cargo ship used during World War I. Following the War of 1812, the US Army began construction on "Fort Blunder", an unnamed fortification built at the northernmost end of Lake Champlain to protect against attacks from British Canada. Its nickname came from a surveying error: the initial phase of construction on the fort turned out to be taking place on a point .75 miles (1.21 km) north of the Canadian border. Once this error was spotted, construction was abandoned. Locals scavenged materials used in the abandoned fort for use in their own homes and public buildings. By the Webster-Ashburton Treaty of 1842, the US-Canadian border was adjusted northward to include the strategically important site of "Fort Blunder" on the US side. In 1844, work was begun to replace the remains of the 1812-era fort with a massive new Third System masonry fortification known as Fort Montgomery. Portions of this fort are still standing. A 1902 photograph of Fort Henry at Lake Champlain. In 1909, 65,000 people celebrated the 300th anniversary of the French discovery of the lake. Attending dignitaries included President William Howard Taft, along with representatives from France, Canada and the United Kingdom. In 1929, then-New York Governor Franklin Roosevelt and Vermont Governor John Weeks, dedicated the first bridge to span the lake, built from Crown Point to Chimney Point. This bridge lasted until December 2009. Severe deterioration was found, and the bridge was demolished and replaced with the Lake Champlain Bridge, which opened in November 2011. On February 19, 1932, boats were able to sail on Lake Champlain. It was the first time that the lake was known to be free of ice during the winter at that time. Lake Champlain briefly became the nation's sixth Great Lake on March 6, 1998, when President Clinton signed Senate Bill 927. This bill, which reauthorized the National Sea Grant Program, contained a line declaring Lake Champlain to be a Great Lake. This status enabled its neighboring states to apply for additional federal research and education funds allocated to these national resources. Following a small uproar, the Great Lake status was rescinded on March 24 (although New York and Vermont universities continue to receive funds to monitor and study the lake). In 1609 Samuel de Champlain wrote that he saw a lake monster five feet (1.5 m) long, as thick as a man's thigh, with silver-gray scales a dagger could not penetrate. The alleged monster had 2.5 foot (0.76 m) jaws with sharp and dangerous teeth. Native Americans claimed to have seen similar monsters 8 to 10 feet (2.4 to 3.0 m). This mysterious creature is likely the original Lake Champlain monster. :20 The monster has been memorialized in sports teams names and mascots: the Vermont Lake Monsters and mascot (Champ) of the state's minor league baseball team. A Vermont Historical Society publication recounts the story and offers factual explanations for accounts of the so-called monster: "floating logs, schools of large sturgeons diving in a row, or flocks of black birds flying close to the water." A pollution prevention, control, and restoration plan for Lake Champlain was first endorsed in October 1996 by the governors of New York and Vermont, and the regional administrators of the EPA (United States Environmental Protection Agency). In April 2003, the plan was updated and Quebec signed onto it. The plan is being implemented by the Lake Champlain Basin Program and its partners at the state, provincial, federal and local level. It is renowned as a model for interstate and international cooperation. Its primary goals are to reduce phosphorus inputs to Lake Champlain; reduce toxic contamination; minimize the risks to humans from water-related health hazards; and control the introduction, spread, and impact of non-native nuisance species to preserve the integrity of the Lake Champlain ecosystem. Agricultural and urban runoff from the watershed or drainage basin is the primary source of excess phosphorus, which exacerbates algae blooms in Lake Champlain. The most problematic blooms have been cyanobacteria, commonly called blue-green algae, in the northeastern part of the Lake, primarily Missisquoi Bay. To reduce phosphorus runoff to this part of the lake, Vermont and Quebec agreed to reduce their inputs by 60% and 40%, respectively, by an agreement signed in 2002. While agricultural sources (manure and fertilizers) are the primary sources of phosphorus (about 70%) in the Missisquoi basin, runoff from developed land and suburbs is estimated to contribute about 46% of the phosphorus runoff basin-wide to Lake Champlain, and agricultural lands contributed about 38%. In 2002, the cleanup plan noted that the lake had the capacity to absorb 110 metric tons (110 long tons; 120 short tons) of phosphorus each year. In 2009, a judge noted that 218 metric tons (215 long tons; 240 short tons) were still flowing in annually, more than twice what the lake could handle. Sixty municipal and industrial sewage plants discharge processed waste from the Vermont side. In 2008, the EPA expressed concerns to the State of Vermont that the Lake's cleanup was not progressing fast enough to meet the original cleanup goal of 2016. The State, however, cites its Clean and Clear Action Plan as a model that will produce positive results for Lake Champlain. In 2007, Vermont banned phosphates for dishwasher use starting in 2010. This will prevent an estimated 2–3 short tons (1.8–2.7 t) from flowing into the lake. While this represents 0.6% of the phosphate pollution, it took $1.9 million to remove the pollutant rom treated wastewater, an EPA requirement. Despite concerns about pollution, Lake Champlain is safe for swimming, fishing, and boating. It is considered a world-class fishery for salmonid species (Lake trout and Atlantic salmon) and bass. About 81 fish species live in the Lake, and more than 300 bird species rely on it for habitat and as a resource during migrations. By 2008 at least six institutions monitoring lake water health: 1) In 2002 the Conservation Law Foundation appointed a "lakekeeper," who reviews the state's pollution controls, 2) Friends of Missisquoi Bay was formed in 2003, 3) the Lake Champlain Committee, 4) Vermont Water Resources Board hired a water quality expert in 2008 to write water quality standards and create wetland protection rules, 5) In 2007 the Vermont Agency of Natural Resources appoints a "Lake czar" to oversee pollution control. Clean and Clear, an agency of the Vermont state government established in 2004; and 6) the Nature Conservancy, a non-profit group, focuses on biodiversity and ecosystem health. In 2001, scientists estimated that farming contributed 38% of the phosphorus runoff. By 2010, results of environmentally conscious farming practices, enforced by law, had made any positive contribution to lake cleanliness. A federally funded study was started to analyze this problem and to arrive at a solution. Biologists have been trying to control lampreys in the lake since 1985 or earlier. Lampreys are native to the area, but have expanded in population to such an extent that they wounded nearly all Lake trout in 2006 and 70-80% of salmon. The use of pesticides against the lamprey has reduced their casualties of other fish to 35% of salmon and 31% of lake trout. The goal was 15% of salmon and 25% of lake trout. The federal and state governments originally budgeted $18 million for lake programs for 2010. This was later supplemented by an additional $6.5 million from the federal government. The causeway connecting Colchester and South Hero. Historically four significant railroad crossings were built over the lake. As of 2011, only one remains. The Island Line Causeway. This marble rock-landfill causeway stretched from Colchester, Vermont (on the mainland) three miles (5 km) north and west to South Hero, Vermont. Two breaks in the causeway were spanned by a fixed iron trestle and a swing bridge that could be opened to allow boats to pass. Rutland Railroad (later Rutland Railway) operated trains over this causeway from 1901-1961. The Railway was officially abandoned in 1963, with tracks and trestles removed over the course of the ten years that followed. The marble causeway still remains, as does the fixed iron trestle that bridges the lesser of the two gaps. The swing bridge over the navigation channel was removed sometime in the early 1970s. The Alburgh, Vermont - Rouses Point, New York rail trestle. From sometime in the late 19th century until 1964, this wooden trestle carried two railroads (the Rutland Railroad and the Central Vermont Railroad) over the lake just south of the US 2 vehicular bridge. The iron swing bridge at the center (over the navigation channel) has been removed. Most of the wooden pilings remain and can easily be seen looking south from the US 2 bridge. Part of the trestle on the Rouses Point side has been converted for use as an access pier associated with the local marina. The Swanton - Alburgh, Vermont rail trestle. Built in the same manner as at Rouses Point, it crosses the lake just south of Missisquoi Bay and the Canadian border, within yards south of the Vermont Route 78 bridge. It is still in use by the New England Central Railroad. In 2010, the estimate of cormorant population, now classified as a nuisance species because they take so much of the lake fish, ranged from 14,000 to 16,000. A Fish and Wildlife commissioner said that the ideal population would be 3,300 or about 3 per 1 square kilometre (0.39 sq mi). Cormorants had disappeared from the lake (and all northern lakes) due to the use of DDT in the 1940s and 1950s, which made their eggs more fragile and reduced breeding populations. Ring-billed gulls are also considered a nuisance. Measures have been taken to reduce their population. Authorities are trying to encourage the return of black crowned night herons, cattle egrets, and great blue herons, which disappeared during the time DDT was being widely used. A few kilometres to the northeast of the town of East Alburgh, Vermont, Province Point is the southernmost tip of a small promontory approximately 2 acres (1 ha) in size . The promontory is cut through by the US-Canadian border; as such the area is a practical exclave of the United States contiguous with Canada. The Champlain Bridge between New York and Vermont, demolished in December of 2009. The LCTC ferry slip at Grand Isle, Vermont. Two roadways cross over the lake, connecting Vermont and New York. Since November 2011, the Lake Champlain Bridge has crossed the southern part of the lake, connecting Chimney Point in Vermont with Crown Point, New York. It replaced Champlain Bridge, which was closed in 2009 because of severe structural problems found that could have resulted in a collapse. In 2009, the bridge had been used by 3,400 drivers per day, and driving around the southern end of the lake added two hours to the trip. Ferry service was re-established to take some of the traffic burden. On December 28, 2009, the bridge was destroyed in a controlled demolition. A new bridge was rapidly constructed by a joint state commitment, opening on November 7, 2011. To the north, US 2 runs from Rouses Point, New York to Grand Isle County, Vermont in the town of Alburgh, before continuing south along a chain of islands towards Burlington. To the east, Vermont Route 78 runs from an intersection with US 2 in Alburgh through East Alburgh to Swanton. The US 2-VT 78 route technically runs from the New York mainland to an extension of the mainland between two arms of the lake and then to the Vermont mainland, but it provides a direct route across the two main arms of the northern part of the lake. While the old bridge was being demolished and the new one constructed, Lake Champlain Transportation Company operated a free, 24-hour ferry from just south of the bridge to Chimney Point in Vermont at the expense of the states of New York and Vermont at a cost to the states of about $10 per car. The most southerly crossing is the Fort Ticonderoga Ferry, connecting Ticonderoga, New York with Shoreham, Vermont just north of the historic fort. The Swanton, VT, to East Alburg, Vermont, rail trestle. Lake Champlain has been connected to the Erie Canal via the Champlain Canal since the canal's official opening September 9, 1823, the same day as the opening of the Erie Canal from Rochester on Lake Ontario to Albany. It connects to the St. Lawrence River via the Richelieu River, with the Chambly Canal bypassing rapids on the river since 1843. Together with these waterways the lake is part of the Lakes to Locks Passage. The Lake Champlain Seaway, a project to use the lake to bring ocean-going ships from New York City to Montreal, was proposed in the late 19th century and considered as late as the 1960s, but rejected for various reasons. Burlington, Vermont (pop. 42,217, 2010 Census) is the largest city on the lake. The 2nd and 3rd most populated cities/towns are (Plattsburgh, New York, and Colchester, Vermont, respectively) combined. The fourth-largest community is the city of South Burlington. USCG, Burlington, Vermont - main installation. There is a historic stone lighthouse located on Cumberland Head, which is privately owned. The privately owned Isle La Motte lighthouse on the northern end of the island was originally red, but it faded to pink over time. The privately owned cast iron Juniper Island Light dates from 1846. In 1954 it was deactivated and replaced by a steel tower. On Point Au Roche, part of Beekmantown, New York, there is a privately owned, historic lighthouse. Valcour Island, near the New York shore is home to Bluff Point Lighthouse, built in 1871. 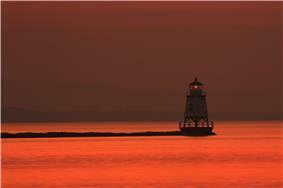 It was manned by a full-time lightkeeper until 1930, making it one of the last lighthouses to be manned on the Lake. The Cumberland Head Light operated until 1934. Split Rock Lighthouse, NY south of Essex, NY, near a natural boundary of the territory between the Mohawk and Algonquin tribes. All active navigational aids on the American portion of the lake are maintained by USCG Burlington station, along with those on international Lake Memphremagog to the east. Aids to navigation on the Canadian portion of the lake are maintained by the Canadian Coast Guard. There are a number of parks in the Lake Champlain region of both Vermont and New York. Two on the New York side of the lake include Point Au Roche State Park, which have hiking and cross country skiing trails. A public beach is located on park grounds, and the Ausable Point State Park. 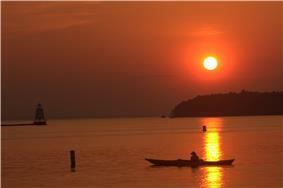 The Cumberland Bay State Park is located on Cumberland Head, with a campground, city beach, and sports fields. Vermont Department of Fish and Wildlife boat docked near ECHO Aquarium. There are various parks along the lake on the Vermont side, including Sand Bar State Park in Milton, featuring a 2,000 feet (610 m) natural sand beach, swimming,canoe and kayak rentals, food concession, picnic grounds and a play area. At 226 acres (91 ha), Grand Isle State Park contains camping facilities, a sand volleyball court, a nature walk trail, a horseshoe pit and a play area. Burlington's Waterfront Park is a revitalized industrial area. Coast Guard Station Burlington provides "Search and Rescue, Law Enforcement and Ice Rescue services 24 hours a day, 365 days a year." Services are also provided by local, and state, and federal governments bordering on the lake, including the US Border Patrol, Royal Canadian Mounted Police, Vermont State Police, New York State Police Marine Detail, and Vermont Fish and Wildlife wardens. ^ "Physiographic divisions of the conterminous U. S.". U.S. Geological Survey. Retrieved December 6, 2007. 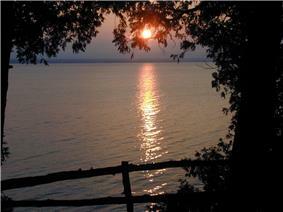 ^ "Champlain, Lake". The Canadian encyclopedia. February 12, 2011. ^ Veyron, Michel (1989). Dictionnaire canadien des noms propres (in Français). Éditions Larousse. p. 764. ^ "Lake Champlain Lake Level - King St. 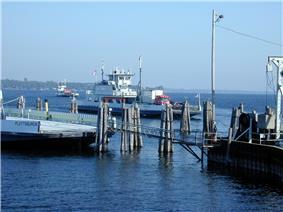 Ferry Dock (1977-2006)". 2012-05-03. ^ Curran, John (August 11, 2010). "State seeks dismissal of phosphorus lawsuit". Burlington, Vermont: Burlington Free Press. pp. 1B. ^ Sutkoski, Matt. "Lack of ice cover might be affecting the ecology of Lake Champlain". ^ "NWS Burlington Lake Champlain Forecast Page". ^ "Abenaki". Abenakination.org. Retrieved March 2, 2011. ^ "Indian Summer | Seven Days". 7dvt.com. Retrieved March 2, 2011. ^ "'"Champlain's journal: Entering 'The Lake Between. Pqasb.pqarchiver.com. July 14, 2009. Retrieved March 2, 2011. ^ Hyde, Bruce (January 3, 2008). My Turn:Get ready to celebrate the 400th. ^ "1909 Champlain Tercentenary Celebration of the Discovery of Lake Champlain". Hrmm.org. Retrieved March 2, 2011. ^ "Vermont History Timeline". historicvermont.org. August 26, 2010. ^ Lake Champlain, The Sixth Great Lake? - Geography - 03/02/98. Geography.about.com (1998-03-06). Retrieved on 2013-07-12. ^ "Vermont Lake Monsters Home Page". The Official Site of Minor League Baseball. 2011. Retrieved October 11, 2011. ^ "Vermont's Very Own Monster". Vermont Historical Society. Retrieved October 11, 2011. ^ "Lake Champlain Management Plan, April 2003". ^ "Missisquoi Bay Phosphorus Reduction Agreement, August 2002" (PDF). ^ Troy A., Wang D. and Capen D. (2007 http://www.lcbp.org/publication_detail.aspx?id=211). Updating the Lake Champlain Basin Land Use Data to Improve Prediction of Phosphorus Loading. Lake Champlain Basin Program. ^ Page, Candace (July 9, 2009). "Sewage:Judge sides with CLF, throws out Montpelier permit". Burlington, Vermont: Burlington Free Press. pp. 4A. ^ "Vermont Clean and Clear Action Plan". ^ Baird, Joel Banner (June 26, 2010). "Detergents must soon be phosphate free". Burlington, Vermont: Burlington Free Press. pp. 1A. ^ Lake Champlain Basin Atlas: Plants and Animals", 2004""". Lcbp.org. Retrieved March 2, 2011. ^ Page, Candace (July 6, 2010). "Lake Champlain cleanup effort focuses on Rock Rive6". Burlington Free Press (Burlington, Vermont). pp. 1B. ^ Page, Candace (January 22, 2009). Lamprey wounds decrease. Burlington Free Press. ^ Page, Candace (July 24, 2010). "Lake scores $6.5 million". Burlington, Vermont: Burlington Free Press. pp. 1A. ^ National Ocean and Atmospheric Administration (1992). Lake Champlain New York – Vermont: Cumberland Head to Four Brothers Island (Map). 1:40,000 (23rd ed.). Washington DC. ^ "State Rail & Policy Plan, 2006". Vermont Agency of Transportation. 2006. p. 20. ^ a b Page, Candace (July 11, 2010). "Cutting the cormorant population". Burlington, Vermont: Burlington Free Press. pp. 1C, 8C. ^ "Controlled explosions bring down Lake Champlain Bridge, unsafe NY-VT span was closed in Oct.". ^ "Ferry At Champlain Bridge Set To Start Running". WPTZ. January 31, 2010. ^ "A Tour of the Historic Lake Champlain Islands by Jim Millard". Historiclakes.org. December 5, 2010. Retrieved March 2, 2011. ^ "Watchtowers on the Water - NYS Dept. of Environmental Conservation". Dec.ny.gov. March 19, 2003. Retrieved March 2, 2011. ^ Canadian Coast Guard (December 9, 2009). "Canadian Coast Guard - Marinfo". ^ Vermont State Police (November 12, 2009). "Recreation Unit and Education Unit". ^ New York State, Division of State Police. "Marine Detail". Retrieved December 11, 2009. ^ "Vermont Fish and Wildlife". Retrieved January 4, 2010.